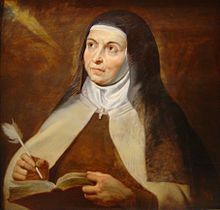 Saint Teresa of Avila (Teresa de Jesús) (28 March 1515 – 4 October 1582), born Teresa de Cepeda y Ahumada, was a Spanish mystic philosopher and Catholic saint. It seems as if Thou didst subject those who love Thee to a severe trial: but it is in order that they may learn, in the depths of that trial, the depths of Thy love. The evil spirits keep us in terror, because we expose ourselves to the assaults of terror by our attachments to honours, possessions, and pleasures. May it please our Lord that I be not one of these; and may His Majesty give me grace to take that for peace which is really peace, that for honour which is really honour, and that for delight which is really a delight. Let me never mistake one thing for another — and then I snap my fingers at all the devils, for they shall be afraid of me. One of my brothers was nearly of my own age; and he it was whom I most loved, though I was very fond of them all, and they of me. He and I used to read Lives of Saints together. When I read of martyrdom undergone by the Saints for the love of God, it struck me that the vision of God was very cheaply purchased; and I had a great desire to die a martyr's death, — not out of any love of Him of which I was conscious, but that I might most quickly attain to the fruition of those great joys of which I read that they were reserved in Heaven; and I used to discuss with my brother how we could become martyrs. We settled to go together to the country of the Moors, begging our way for the love of God, that we might be there beheaded; and our Lord, I believe, had given us courage enough, even at so tender an age, if we could have found the means to proceed; but our greatest difficulty seemed to be our father and mother. It will be as well, I think, to explain these locutions of God, and to describe what the soul feels when it receives them, in order that you, my father, may understand the matter; for ever since that time of which I am speaking, when our Lord granted me that grace, it has been an ordinary occurrence until now, as will appear by what I have yet to say. The words are very distinctly formed; but by the bodily ear they are not heard. They are, however, much more clearly understood than they would be if they were heard by the ear. It is impossible not to understand them, whatever resistance we may offer. When we wish not to hear anything in this world, we can stop our ears, or give attention to something else: so that, even if we do hear, at least we can refuse to understand. In this locution of God addressed to the soul there is no escape, for in spite of ourselves we must listen; and the understanding must apply itself so thoroughly to the comprehension of that which God wills we should hear, that it is nothing to the purpose whether we will it or not; for it is His will, Who can do all things. All things fail; but Thou, Lord of all, never failest! They who love Thee, oh, how little they have to suffer! oh, how gently, how tenderly, how sweetly Thou, O my Lord, dealest with them! Oh, that no one had ever been occupied with any other love than Thine! It seems as if Thou didst subject those who love Thee to a severe trial: but it is in order that they may learn, in the depths of that trial, the depths of Thy love. O my God, oh, that I had understanding and learning, and a new language, in order to magnify Thy works, according to the knowledge of them which my soul possesses! Everything fails me, O my Lord; but if Thou wilt not abandon me, I will never fail Thee. Let all the learned rise up against me, — let the whole creation persecute me, — let the evil spirits torment me, — but do Thou, O Lord, fail me not; for I know by experience now the blessedness of that deliverance which Thou dost effect for those who trust only in Thee. In this distress, — for then I had never had a single vision, — these Thy words alone were enough to remove it, and give me perfect peace: "Be not afraid, my daughter: it is I; and I will not abandon thee. Fear not." It seems to me that, in the state I was in then, many hours would have been necessary to calm me, and that no one could have done it. Yet I found myself, through these words alone, tranquil and strong, courageous and confident, at rest and enlightened; in a moment, my soul seemed changed, and I felt I could maintain against all the world that my prayer was the work of God. Oh, how good is God! how good is our Lord, and how powerful! He gives not counsel only, but relief as well. His words are deeds. O my God! as He strengthens our faith, love grows. Seeing, then, that our Lord is so powerful, — as I see and know He is, — and that the evil spirits are His slaves, of which there can be no doubt, because it is of faith, — and I a servant of this our Lord and King, — what harm can Satan do unto me? Why have I not strength enough to fight against all hell? I took up the cross in my hand, — I was changed in a moment into another person, and it seemed as if God had really given me courage enough not to be afraid of encountering all the evil spirits. I feared them so little, that the terrors, which until now oppressed me, quitted me altogether; and though I saw them occasionally, — I shall speak of this by and by, — I was never again afraid of them — on the contrary, they seemed to be afraid of me. I found myself endowed with a certain authority over them, given me by the Lord of all, so that I cared no more for them than for flies. They seem to be such cowards; for their strength fails them at the sight of any one who despises them. These enemies have not the courage to assail any but those whom they see ready to give in to them, or when God permits them to do so, for the greater good of His servants, whom they may try and torment. May it please His Majesty that we fear Him whom we ought to fear, and understand that one venial sin can do us more harm than all hell together; for that is the truth. The evil spirits keep us in terror, because we expose ourselves to the assaults of terror by our attachments to honours, possessions, and pleasures. For then the evil spirits, uniting themselves with us, — we become our own enemies when we love and seek what we ought to hate, — do us great harm. We ourselves put weapons into their hands, that they may assail us; those very weapons with which we should defend ourselves. It is a great pity. But if, for the love of God, we hated all this, and embraced the cross, and set about His service in earnest, Satan would fly away before such realities, as from the plague. He is the friend of lies, and a lie himself. He will have nothing to do with those who walk in the truth. When he sees the understanding of any one obscured, he simply helps to pluck out his eyes; if he sees any one already blind, seeking peace in vanities, — for all the things of this world are so utterly vanity, that they seem to be but the playthings of a child, — he sees at once that such a one is a child; he treats him as a child, and ventures to wrestle with him — not once, but often. May it please our Lord that I be not one of these; and may His Majesty give me grace to take that for peace which is really peace, that for honour which is really honour, and that for delight which is really a delight. Let me never mistake one thing for another — and then I snap my fingers at all the devils, for they shall be afraid of me. I do not understand those terrors which make us cry out, Satan, Satan! when we may say, God, God! and make Satan tremble. Do we not know that he cannot stir without the permission of God? What does it mean? I am really much more afraid of those people who have so great a fear of the devil, than I am of the devil himself. Satan can do me no harm whatever, but they can trouble me very much, particularly if they be confessors. I have spent some years of such great anxiety, that even now I am amazed that I was able to bear it. Blessed be our Lord, who has so effectually helped me! Variant translation: I do not fear Satan half so much as I fear those who fear him. I saw an angel close by me, on my left side, in bodily form. This I am not accustomed to see, unless very rarely. Though I have visions of angels frequently, yet I see them only by an intellectual vision, such as I have spoken of before. It was our Lord's will that in this vision I should see the angel in this wise. He was not large, but small of stature, and most beautiful — his face burning, as if he were one of the highest angels, who seem to be all of fire: they must be those whom we call cherubim. Their names they never tell me; but I see very well that there is in heaven so great a difference between one angel and another, and between these and the others, that I cannot explain it. I saw in his hand a long spear of gold, and at the iron's point there seemed to be a little fire. He appeared to me to be thrusting it at times into my heart, and to pierce my very entrails; when he drew it out, he seemed to draw them out also, and to leave me all on fire with a great love of God. The pain was so great, that it made me moan; and yet so surpassing was the sweetness of this excessive pain, that I could not wish to be rid of it. The soul is satisfied now with nothing less than God. The pain is not bodily, but spiritual; though the body has its share in it, even a large one. It is a caressing of love so sweet which now takes place between the soul and God, that I pray God of His goodness to make him experience it who may think that I am lying. Most of these trials and times of unrest come from the fact that we do not understand ourselves. It is no small pity, and should cause us no little shame, that, through our own fault, we do not understand ourselves, or know who we are. Would it not be a sign of great ignorance, my daughters, if a person were asked who he was, and could not say, and had no idea who his father or mother was, or from what country he came? Though that is a great stupidity, our own is incomparably greater if we make no attempt to discover what we are, and only know that we are living in these bodies and have a vague idea, because we have heard it, and because our faith tells us so, that we possess souls. As to what good qualities there may be in our souls, or who dwells within them, or how precious they are — those are things which seldom consider and so we trouble little about carefully preserving the soul's beauty. All our interest is centred in the rough setting of the diamond and in the outer wall of the castle – that is to say in these bodies of ours. 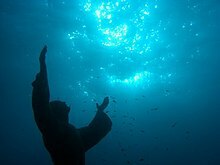 We shall never learn to know ourselves except by endeavoring to know God; for, beholding His greatness we realize our own littleness; His purity shows us our foulness; and by meditating upon His humility we find how very far we are from being humble. Just as we cannot stop the movement of the heavens, revolving as they do with such speed, so we cannot restrain our thought. And then we send all the faculties of the soul after it, thinking we are lost, and have misused the time that we are spending in the presence of God. Yet the soul may perhaps be wholly united with Him in the Mansions very near His presence, while thought remains in the outskirts of the castle, suffering the assaults of a thousand wild and venomous creatures and from this suffering winning merit. So this must not upset us, and we must not abandon the struggle, as the devil tries to make us do. Most of these trials and times of unrest come from the fact that we do not understand ourselves. God gave us faculties for our use; each of them will receive its proper reward. Then do not let us try to charm them to sleep, but permit them to do their work until divinely called to something higher. We cannot know whether we love God, although there may be strong reason for thinking so; but there can be no doubt about whether we love our neighbor or not. Be sure that, in proportion as you advance in fraternal charity, you are increasing your love of God, for His Majesty bears so tender an affection for us that I cannot doubt He will repay our love for others by augmenting, and in a thousand different ways, that which we bear for Him. Never exaggerate, but express your feelings with moderation. Never affirm anything unless you are sure it is true. Reflect upon the providence and wisdom of God in all created things and praise Him in them all. Never compare one person with another: comparisons are odious. First attributed to St. Teresa by Truman Capote in "Go Ahead and Ask Me Anything.' (And So She Did): An Interview with Truman Capote" by Gloria Steinem, in McCall's magazine (November 1967), as the source of the title of a novel he was working on called Answered Prayers. Likely a variant of “I remember having read somewhere, in some strange book, that when the gods wish to punish us they answer our prayers,” a quip found in act 2 of Oscar Wilde's play An Ideal Husband. Carmel's Heights - This CD album is an attempt to share with all, some of Carmel's Saints - real persons of flesh and blood - who share with us in song their own spiritual experiences.